We’re over halfway through the Challenge, folks. Honestly? Today was the best I’ve felt so far. Maybe it was because I got to see Mike. Maybe it’s because I realized that we probably have enough food for the week. Either way, I’m going to go to bed happy and a little less worried tonight. Apparently he thought it was just (really bad) ricotta! Well, surprise – there is no ricotta in this, either! I subbed in low fat cottage cheese (easier on the wallet and on the waistline) and mixed in plenty of good-for-you spinach. Cook noodles according to package directions. Drain, and set aside on a large baking sheet to dry out slightly. Meanwhile, heat oil in a large nonstick pan over medium heat. Add garlic and cook, stirring frequently, for 30 seconds. Add tofu and spinach and cook, stirring, until spinach wilts, about 2 – 3 minutes. Remove pan from heat and let cool for 5 minutes. Stir in cottage cheese, 1/3 cup Parmesan cheese, salt and pepper. Spread 1 cup sauce in the bottom of a large baking dish. 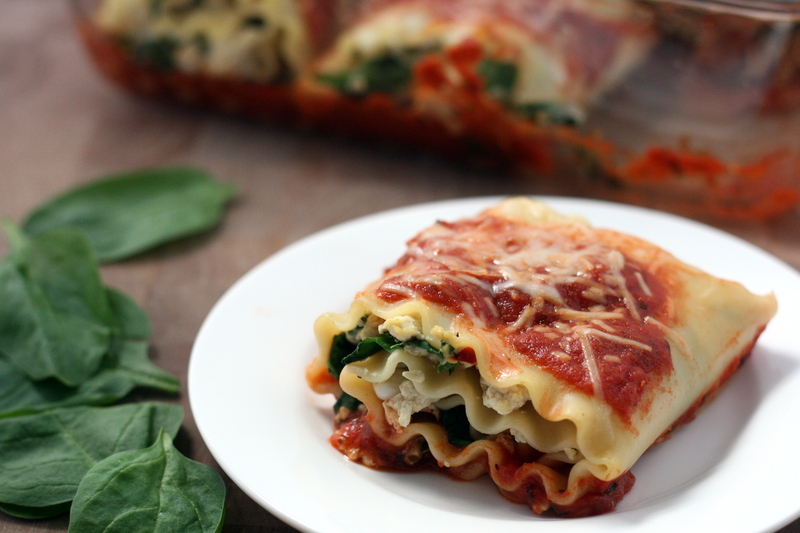 To make the lasagna rolls, place about 1/4 cup mixture on a noodle and spread across the entire noodle. Roll up and place the roll, seam-side down, in the prepared baking dish. Repeat with the remaining noodles and filling. Spoon remaining sauce over top of the lasagna rolls and sprinkle with the remaining Parmesan cheese. Bake in preheated oven for 20 minutes or until heated through and cheese is melted. 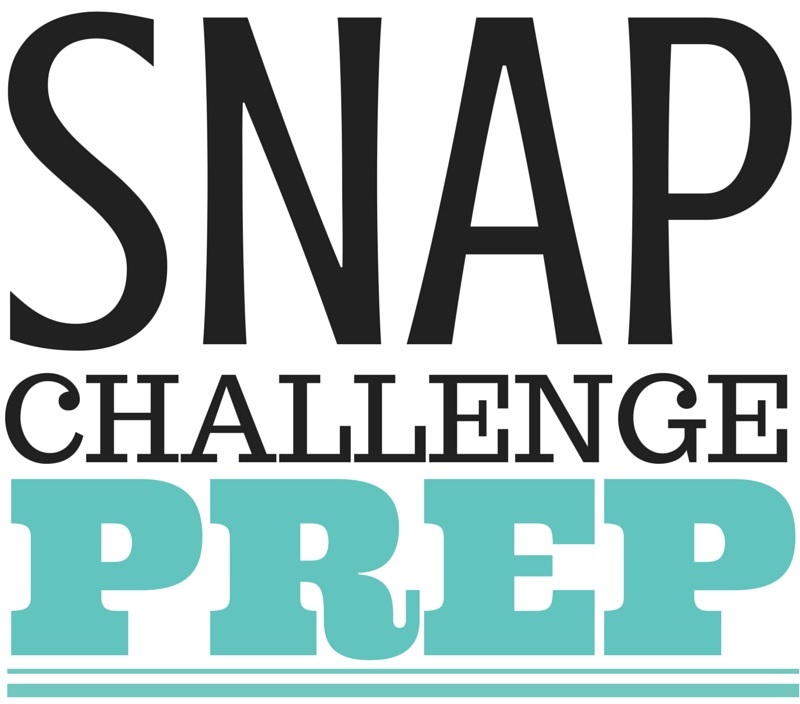 Categories: Main Entrees, Meatless, Money Matters, Pasta, SNAP Challenge, Tofu, Vegetarian & Vegan | Tags: main dish, main entree, money matters, pasta, SNAP Challenge, vegetarian | Permalink. 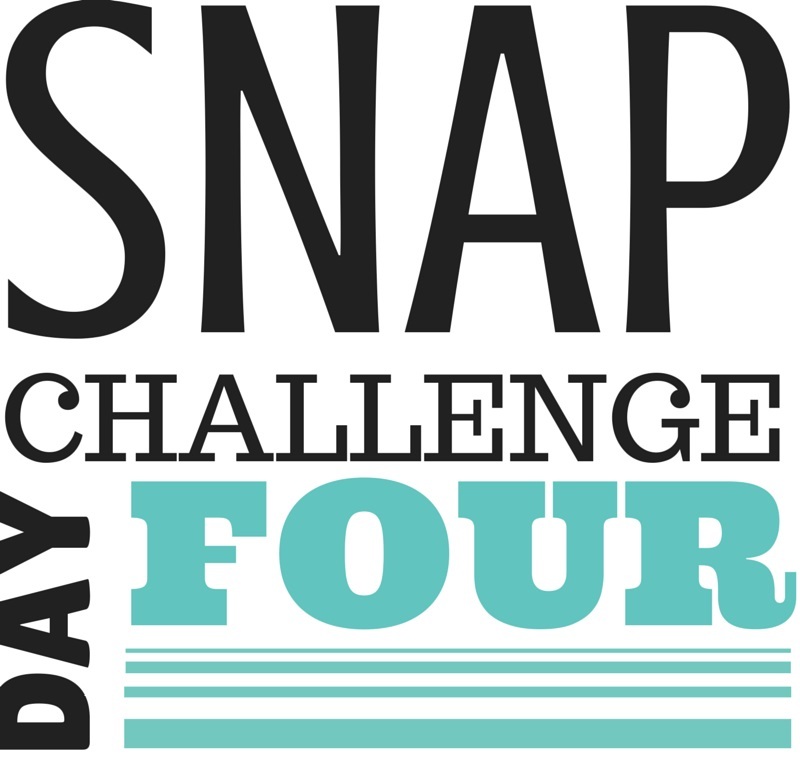 In honor of Hunger Action Month, I am once again taking on the SNAP Challenge from September 15 – 21. With cuts to the SNAP funding last November, we were left with even less to work with this year. The goal was to work with $4.25 per person for each day, giving us $59.50 to work with. This is $3.50 less than what we had last year when we completed the Challenge. It doesn’t seem like much, but $3.50 could have gotten us quite a bit more food. The $59.50 must cover everything we eat or drink in the next week – this means no going out; no free food from family, friends, or coworkers; and no running to the store mid-afternoon for a snack. Any food that you currently have in the house is out-of-bounds, with the exception of spices and condiments. All lunches, as usual, would be dinner leftovers. Some dinners would be leftovers as well. This plan follows pretty closely what I do on a weekly basis – make a few dinners that we eat for several meals. What we picked from the garden: the few tomatoes we had left, two small bell peppers, hot peppers, and zucchini. I think I did OK, but I won’t really be able to tell until the week is over. I will admit that I had a minor meltdown while we were shopping because I realized that I hadn’t planned for enough meals. I had to figure out another meal last-minute and hack off a bunch of “extras” we had on our list like coffee (Mike willingly gave this up! 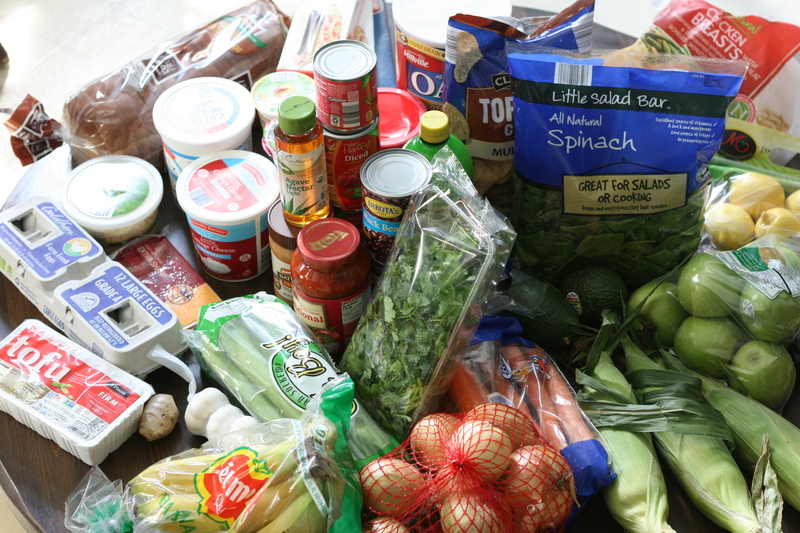 ), almonds, peanuts, and more fruit and vegetables. 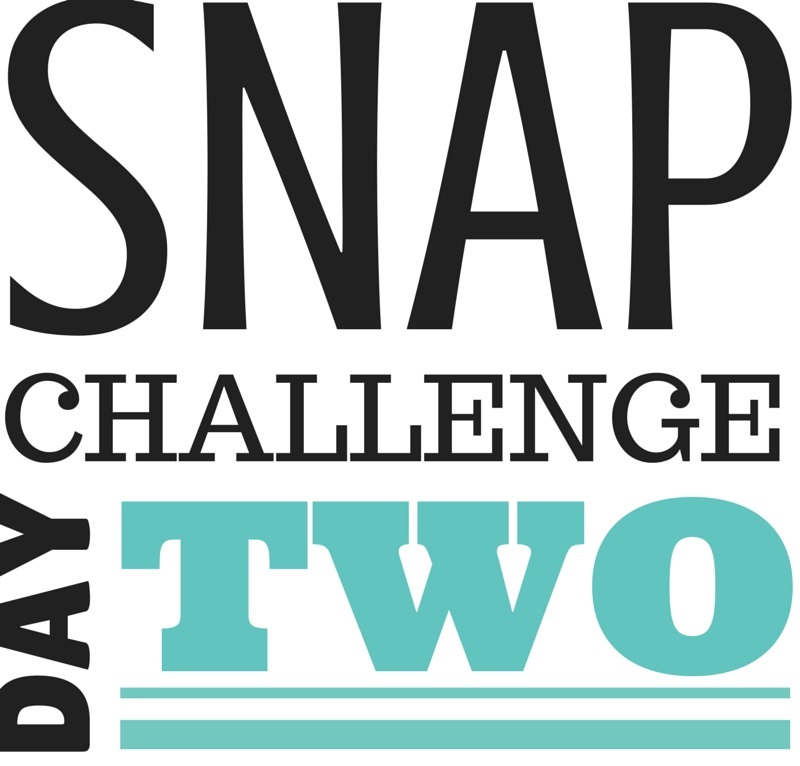 Categories: Money Matters, SNAP Challenge | Tags: money matters, SNAP Challenge | Permalink. When you’re camping, the fewer dishes to wash, the better. Seriously. Mike and I are so determined to keep our dirty dishes to a minimum that we ate straight out of the pan instead of dirtying two plates 🙂 This one-pan meal takes minutes to throw together and minutes to clean up. If you don’t have a fire to cook over, try baking this in the oven! Coat a large cast iron skillet with olive oil. Arrange potatoes on bottom in an even layer. Spread onions, garlic, carrots and mushrooms evenly on top. Arrange sausage over the vegetables. In a small bowl, mix together beef bouillon, onion powder, garlic powder, dried minced onion, and black pepper. Sprinkle spices and soy sauce over the sausage and vegetables. 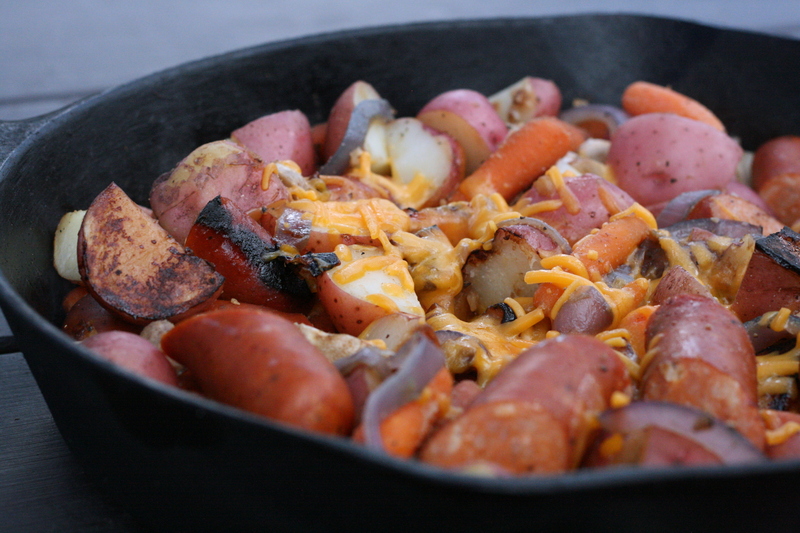 Cover the skillet tightly with heavy-duty foil and cook over a fire for 20 – 30 minutes, stirring once or twice, until potatoes and carrots or tender and sausage is cooked through. Sprinkle with cheese, cover and return to fire for an additional 1 – 2 minutes or until cheese is melted. Categories: Camping Meals, Chicken, Dairy Free, Gluten Free, Main Entrees, Meat, Money Matters, Quick & Easy, Special Diets | Tags: camping meals, dairy free, gluten free, main dish, main entree, money matters, quick and easy, special diets | Permalink. But onto happier things… Mike and I went on our first camping trip of the season this past weekend with our pups. It rained Friday, but Saturday was picture-perfect and we were able to get in a nice long hike. Really long hike. Because we got lost. But hey, what’s the point of life without a little adventure? I’ve got two camping meals to share with you this week. 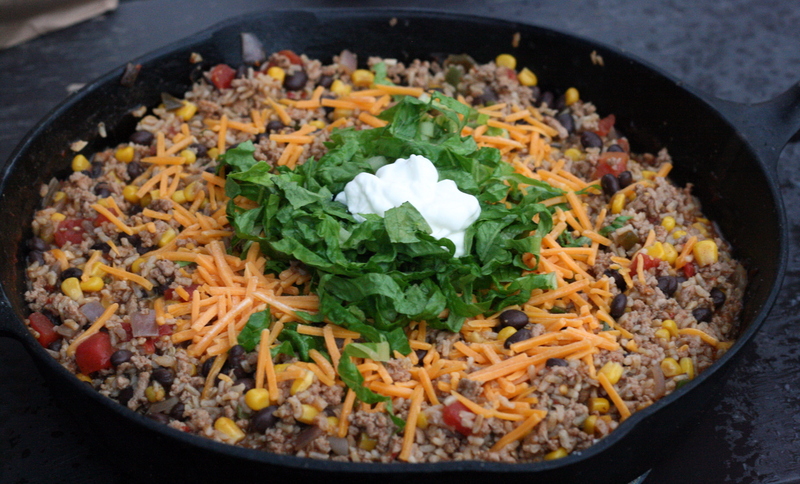 For our Friday night dinner, I made a Turkey and Rice Taco Skillet. It was pouring, but we huddled under the tarp with the dogs and ate our dinner. It was the perfect meal to keep us warm in the cold, wet weather. I figured I would share this recipe first since it kind of works with the whole Cinco de Mayo thing, too. Though this was made over a campfire, it is easily adaptable to be made at home on the stove top. That’s the beauty of cast iron – it can be used inside and outside. I’ve finally gotten my “inside use” Dutch oven and skillet to where they are pretty darn well seasoned. The skillet I used while we were camping, though, has been on hundreds of camping trips with Mike when he was growing up. The skillet is so perfectly seasoned that it puts my pieces to shame. I guess I have something to work on, eh? Spray a large 12″ cast iron skillet with olive oil. Add garlic, onion, and jalapeno and cook over the fire (or medium-high heat) until onions are tender. Add the turkey and cook until browned, about 5 minutes. Stir in taco seasoning and two cups of water. Bring to a simmer and stir in rice and remaining two cups of water. Let simmer for 10 minutes, stirring occasionally. Stir in tomatoes, beans, and corn and continue to cook, stirring occasionally, until liquid is absorbed. To serve, divide between 4 – 6 bowls. Sprinkle with lettuce, cheese and top off with sour cream. Categories: Camping Meals, Main Entrees, Meat, Money Matters, Quick & Easy, Rice, Travel, Turkey | Tags: camping meals, cheese, main dish, main entree, meat, money matters, quick and easy, rice, turkey | Permalink. Spring is here. With spring, comes spring cleaning. Most people clean out their closets and rid the house of dust bunnies. Why don’t ya take it one step further and clean up your lunchtime routine? 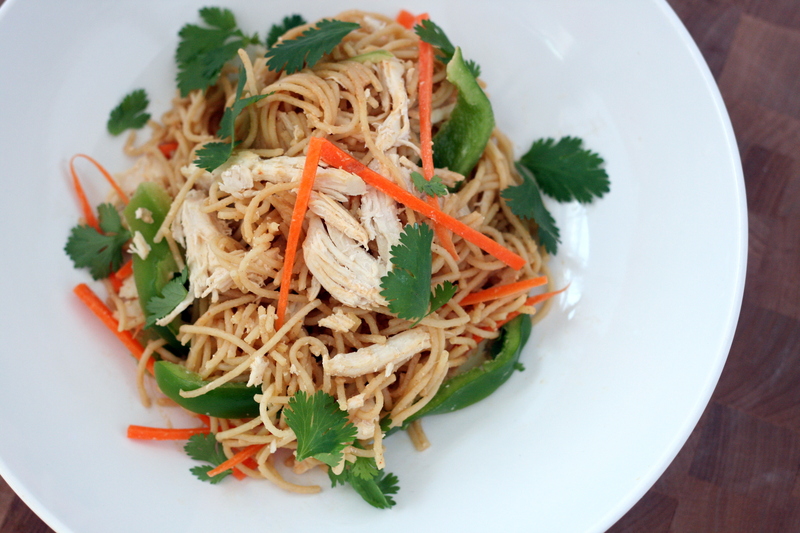 Stop running to the closest fast food joint and prep this at home the night before instead. Your body will thank you. I love quinoa for its amazing health benefits. It has protein, fiber, and iron, plus lots of vitamins and minerals to keep your body healthy and help it repair itself. It’s naturally gluten free and it is one of the few plant foods that is considered a complete protein. As an added bonus, the texture is really, really cool. It can be a bit on the pricier side when you compare it to other grains like pasta, bread, and rice, but it’s worth the cost. (Hint: I like getting it from Costco. They come in huge bags for a good price and it lasts forever.) Asparagus is also packed with fiber, vitamins, and antioxidants. How could you not love a veggie that is a cancer-fightin’, health-improvin’ machine? 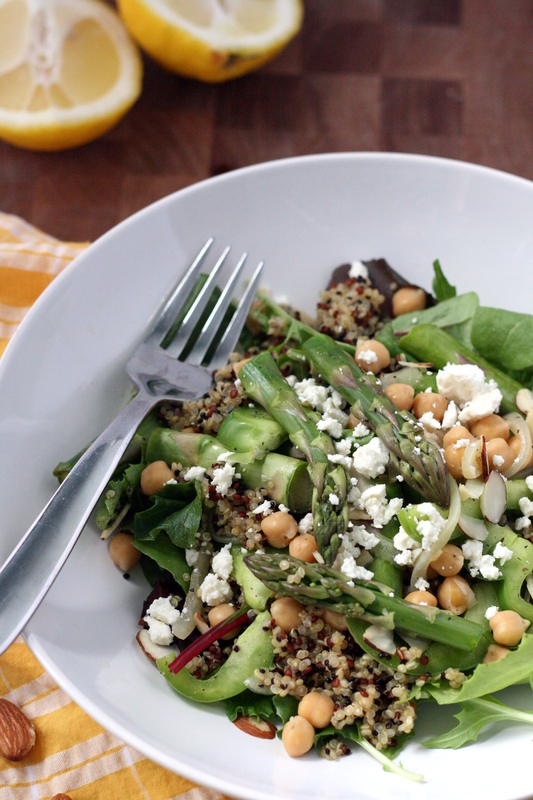 This quinoa bowl is packed with goodness and is so easy to throw together. It’s ready in under 30 minutes and it’s good warm, cold or at room temp. What more could you ask for? Bring chicken broth to a boil. Add quinoa and reduce heat to a simmer. Cover and cook until all liquid is absorbed, about 15 minutes. Meanwhile, prepare the rest of the dish. Spray a large pan with olive oil. Add garlic and onion and saute for 1 – 2 minutes, or until onion softens. Add asparagus, bell pepper, and garbanzo beans and cook until vegetables are tender-crisp, about 3 – 4 minutes. Season with salt and pepper to taste. Remove from heat and squeeze lemon juice over the vegetables. Toss to combine. To serve, divide the spring mix between four bowls. Fluff quinoa with a fork and place on top of greens. Top with vegetables, feta, and almonds. Categories: Gluten Free, Main Entrees, Meatless, Money Matters, Quick & Easy, Salad, Special Diets, Vegetarian & Vegan | Tags: cheese, lemon, main entree, meatless, money matters, quick and easy, quinoa, salad, vegetarian | Permalink. 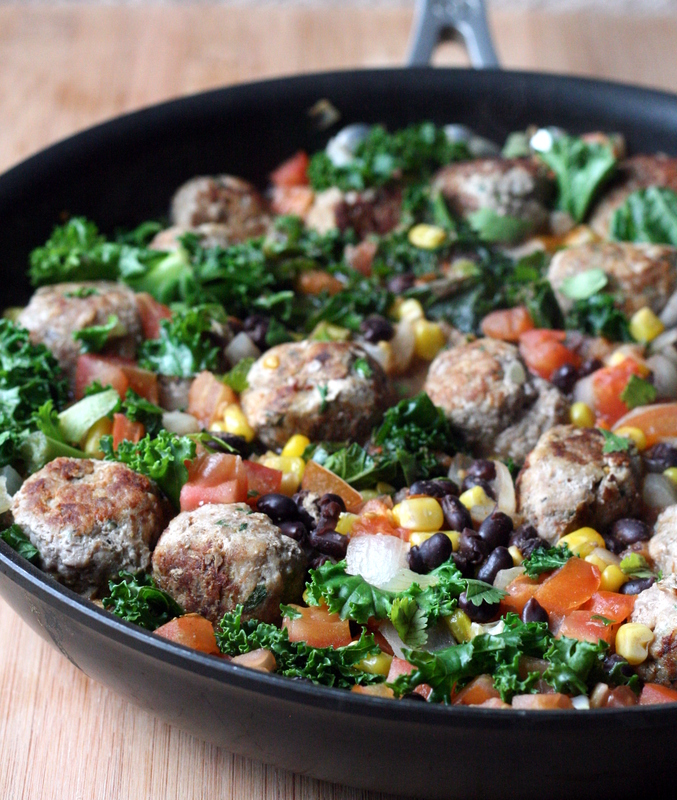 This easy meal uses my favorite baked turkey meatballs and is on the table in 20 minutes. The best part? Cleanup is simple – this is a one pot meal, folks. If you’re a starch-lover like me, serve this with your favorite crusty bread, quinoa, or brown rice. Heat olive oil in a large skillet over medium-high heat. Add onions and garlic and cook, stirring frequently, until onions are soft, about 3 – 5 minutes. Stir in corn, beans, tomatoes, kale, and broth. Season with lime juice, cumin, salt and pepper and stir to combine. Nestle meatballs into the vegetables and bring mixture to a simmer. Partially cover and let cook for 3 – 5 minutes, or until meatballs are heated through. Categories: Dairy Free, Main Entrees, Meat, Money Matters, Quick & Easy, Special Diets, Turkey | Tags: dairy free, main entree, meat, money matters, quick and easy, turkey | Permalink.